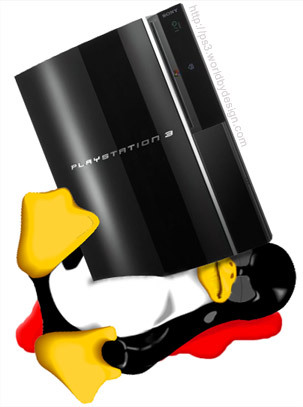 News: PS3 to kill Linux?! When firmware 3:21 gets released on April 1st 2010, one of its updates is to remove the 'Other OS' option from the older PlayStation 3s - Yes, in one foul swoop Sony are killing off Linux on the PS3. I, for one, am not too pleased with this even if I can understand their reasons. The slim PS3 already had the option removed at launch. The reason behind it is due to the widely publicised exploit theory which may have one day lead to the ability to play copied games on the PS3. I feel I must point out that at this point in time it is NOT currently possible to play copied or cracked games - no matter what certain scamming Web sites claim. The exploit would need the ability to run an alternative operating system to get around the security protection. Personally I like the ability to run Linux on my PS3 (PSUbuntu is my flavour of choice). I don't use it very often but its a great feature and one that was advertised at the consoles launch. By taking that away now it cuts out a big chunk of extra possible uses for the PS3. It also takes away the only way home users can develop software to run on their PS3s. The homebrew scene should not be underestimated and it would be a shame to see it destroyed - which I also think is not in Sony's best interest. Another fact which seems to be overlooked is that the PS3 is used in academic and scientific fields due to its Cell CPUs number crunching power. By linking a cluster of them together you get incredible super-computing power for a fraction of the price of using other systems. It would be much easier for them to use Linux or a similar operating system to accomplish this as purchasing the proper PS3 dev kits is still expensive.